A literature review evaluates the available literature in a given subject or topic area for a selected study area. When you write one; it should provide a theoretical base for your research to help in determining the nature of your research. Your literature review should be shed light on the scope of research in the proper language format for the project supervisor to accept it. 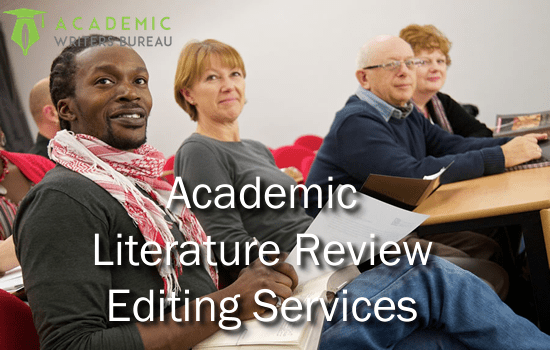 Academic Writers Bureau offers literature review editing services to remove inappropriate content, errors and make it more convincing to readers. A literature review covers a particular area of research and requires editing experience in that niche. We assign each literature review to an expert in the area of an investigation so as to meet the specific requirements of the literature review. We have a high number of editors from diverse branches of sciences and humanities. No matter your area of research, we will find someone who has written and edited numerous literature reviews for the same field. At AWB, you will find an editor who understands the definitions, key terms, terminology, case studies, etc. necessary for your literature review and supporting your topic. Our editing team went through the process of preparing literature reviews and conducting research in their university studies. Because of this experience, the editor who we assign your work knows what it takes to create a stunning literature that impresses the faculty. The Literature review editing services editor will proofread your work to identify then remove errors in grammar, spelling, punctuation and more, so that stands out for flawless language. Additionally, he or she will improve your work to prove that you have an extensive knowledge of literature in your academic field by amending style, sentence structure, coherence, and clarity. We also review the format of references to ensure that it is accurate and consistent. Send your literature review for editing in MS Word, PDF or RTF. Our Editing Team Academicwritersbureau.com has Master’s or Ph.D. level editors who have combined editing experience of more than 20 years. Our team has a broad range of knowledge in various subject matters and fields of study such as medicine, engineering, literature, business management and many others. The experience helps to get the literature review in the right shape for the first time. The editors are also English language experts who will quickly identify grammar issues such as the use of modifiers, paragraph structure, passive voice, conciseness, flow, and transitions. Our editors also have a deep understanding of different referencing styles and ensure that your literature review adheres to style that your university prefers. All customers can gauge the quality of our Literature review editing help by checking free samples of our work on our site. We make ensure that you get flawless literature review by assigning editing work to an expert who we have proven to have the necessary skills to handle your work. We also have supervising editors who review completed orders to determine whether your editor performed proper editing. In the unexpected occasion that we do not completely satisfy you, we promptly amend the literature review to meet your unmet requirements. Do you need Your Literature Review Professionally Edited? Let our Editors do the work for you now. Get an experience of our top rated editing services on your piece. What will it cost me to edit a literature review? We calculate the cost according to your turnaround and word count. You make your payment via PayPal, debit or credit card. We have a secure system for safety and privacy of payment details. I got sound editing for an affordable rate. I recommend AWB for anyone looking for a committed editing firm. AWB is an extremely fast and reliable service that performs quality edits. I will be making editing more orders when I have academic work.